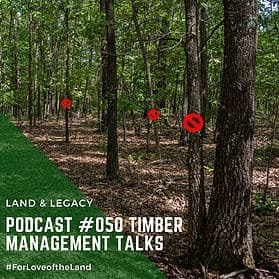 In this week's podcast, we discuss the value and long-term benefit of timber management. With the appropoirate steps taken, timber management can put money in your pocket and improve wildlife habitat at the same time. Timbered areas should not be neglected and left to fend for itself. Timber can be an extremely valuable resource that should be managed in a manner that has the future in mind. With timber being a long-term crop, your work now will pay off in the years to come. Ultimately, our overall goals should be to leave it better than we found it! Leave a legacy of hard work that improved the habitat for wildlife and provided income for following generations.